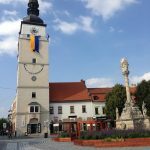 Trnava is situated in the fertile Danubian Lowland at the junction of ancient long-distance routes from Bohemia to Hungary and from the Mediterranean to Poland at the Trnávka River. The oldest traces of settlement here date back to the Palaeolithic Age. Its territory became the part of the Old Hungarian state in the 10th and 11th centuries. One of the predecessors of the town was the small market settlement called Sobota. The oldest written reference to Trnava dates back to 1211. King Bela IV granted German settlers and burghers the privileges of a free royal town in 1238. Trnava was the first town in Slovakia to be granted such privileges and this enabled its rapid development. The basic ground plan of the town consisted of two parallel communications along both sides of the Trnávka River. Even in the 1270s the rectangular town area was defined by fortifications. The walls built of brick had bastions and four towers. After a fire at the turn of the 13th and 14th centuries the town was extended westwards and the present day Trojičné námestie square was created. The excentric position of the Parish Church of St Nicholas indicates the older centre of the town. The Gothic reconstruction of the church lasted until 1440. Several religious orders were settled within the walls down to the end of the 14th century. They built the characteristic dominant features of the town – churches and monasteries. Today the oldest church in the town is the small hospital Church of St Helen, which dates from the first quarter of the 14th century. Numerous recent explorations have confirmed the fact that many of the burgher houses rebuilt in the 16th and 17th centuries have a medieval core that has been confirmed by many experiments at present. 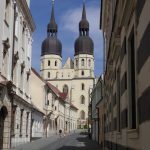 Trnava achieved its greatest boom during the 16th century when the town assumed the functions of the religious and cultural centre of the Kingdom of Hungary at a time when the southernmost parts of the kingdom were occupied by Turks. In 1543 the Archbishop of Esztergom moved to Trnava and thereafter ecclesiastical synods and sessions of the Old Hungarian diet took place in the town. Cardinal Peter Pázmány founded the first complete university there in 1635. The complex of university buildings grew in place of the Dominican church and monastery. It included the first early Baroque building in Slovakia, St John the Baptist Church (1629-1637). Italian artists participated in the construction of this monument and of university buildings as well. The town tower was built in 1574. Two towers of the Parish Church of St Nicholas were built during the same period. The church served as the cathedral for the Archbishop of Esztergom and the chapter from 1543 to 1820. The Archbishop’s Palace was built by the Archbishop Mikuláš Oláh in 1562 as his residence. His name is also connected with the construction of Oláh Seminary in 1561, the first theological seminary on Slovak territory. Numerous Trnava churches belonging to various orders were built or renovated in the Baroque style and these have remained remarkable dominant features of the city’s historic core up until the present day. 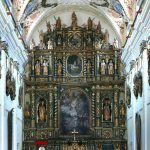 The Jesuit Church of the Most Holy Trinity was built by the Trinitarian order in the years 1710-1729. The Pauline St Josef’s Church represents a type of Protestant parlour church with no tower. The Ursuline Church of St Ann was built in 1776. The Church of the Assumption of the Virgin Mary with monastery has its roots in the 13th century. The Church of St James (the so-called Franciscan Church) was built between 1633 and 1640. Building activity during the reign of Empress Maria Theresa in the second half of the 18th century contributed to the exceptional position of Trnava and influenced the development of Baroque art and architecture in the region. The nickname of the town – ‘Slovak Rome’ – probably dates from this period. Several well-known architects participated in the construction of the university buildings. F A Hildebrand put his signature to the youngest one, the Faculty of Medicine (1772). The Town Hall acquired its modern shape in 1683 and its central building was reconstructed in Classicist style. The Square of the Holy Trinity (Trojičné námestie) was completed by the Baroque Statuary Group of the Most Holy Trinity in 1695. The loss of central functions after the victory of the Alliance over Turks brought Trnava’s boom era to a close. In 1777 it also lost its status as a university town when the seat of the university was moved to Buda. From the late 18th century Trnava became a centre of the literary and artistic Slovak National Revival. The first standard codification of the Slovak language (by priest Anton Bernolák in 1787) was based on the Slovak dialect used in the region of Trnava. The 19th century brought economic revival to Trnava as the population increased. The first horse railway in Old Hungary connected the town with Bratislava in 1846. In 1831 the city theatre building was built on the square in the original Empire style. At the end of the 19th century the Jewish community built its synagogue in the Eastern style. The historic core of Trnava with its preserved complexes of buildings of extraordinary value was declared a Town Conservation Reservation in 1987.